Back in the early 1990s, when everyone jumped aboard the great big bandwagon called Nirvana, some of us would wave Husker Du or Dinosaur Jr records at the neos and shout, 'So why didn't you buy this when it came out, then?' Let's face it, the first time that Nirvana toured Britain it was as Dinosaur Jr's warm-up act. 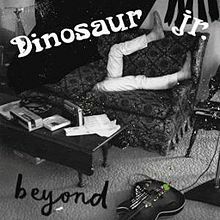 Unfortunately by the time Nirvana broke, Dinosaur Jr's classic grunge line-up was history and J. Mascis had soiled his reputation with Green Mind. Time has a habit of wiping out unpleasant surprises, and Green Mind has been re-assessed and now has many admirers. The albums that followed it remain out-and-out classics. Never been any doubt about that. J. Mascis solo albums? Of course they are. Murph may have jumped in and out of the line-ups, but that doesn't alter the truth of the matter. Ah, but the line-up on those first three fine albums... Well, everyone else has reformed, why not Dinosaur Jr? Mascis and Murph are a given, so welcome back Lou Barlow. They've been playing shows together since 2005 and have just released a new album. The first since either Hand It Over in 1997, or Bug in 1988, depending on where you stand. And it's a stunner, unlike many similar disappointments (Yes, I'm talking 'bout you, Mr Pop!) From the opening guitar curl of Almost Ready, the listener knows that this is a winner. A more melancholic streak runs through this album than those of the 1980s, but that's what old age does for you. Mascis' vocals could never sound gung-ho if he tried, and that's always been part of his charm. Will he manage to stay awake until the end of the song? Layered guitars and fuzz bass tend to win out slightly over Murph's drums, but the waves of electricity coat the songs in something ethereal. Barlow's bass is welcomed back in the rumbling power of tracks like It's Me, proving that this line-up is necessary. They're always been more fun when they remind one of Sonic Youth, and there are few hints of The Cure, for example, in this offering. Mascis's Anglophone tendencies are most obvious in I Got Lost. Joy Division's Atmosphere, anyone? Eleven tracks and not a bad one amongst them. Oh, it's possible to pick out a few flaws. We're Not Alone starts off kind of weak and low-key before shifting onto more interesting ground, and there are other places where it slackens, but that's a Dinosaur Jr album. Some songs are just perfect. The haunting echo of Lightning Bulb is a highlight, as is the dignity and power of the closing What If I Knew. What else? Is it retro? Is class retro? It's available on vinyl, if that makes any difference to you. You really should buy it in one format or another.